One night recently, after his teeth were brushed but before he was tucked into bed and read a book, Oliver asked if he could write his friend a note. Oliver is in first grade. He wakes at 6 a.m., catches the first bus to drive up our street, and spends half the day learning in Mandarin, and the other half in English (with an intro to French, too). He went to his desk, took out a pencil, and ripped a piece of paper from a notebook. He began to write, in English, and hesitated only long enough to ask how to spell tornado. The note was to his best friend, who lives next door, and reported that he’d succeeded in spinning his Beyblade Blast to a new level. Ehi, the friend, had left for a family trip to Benin earlier that day, so Oliver carefully positioned the note at the corner of his desk, and climbed into bed. 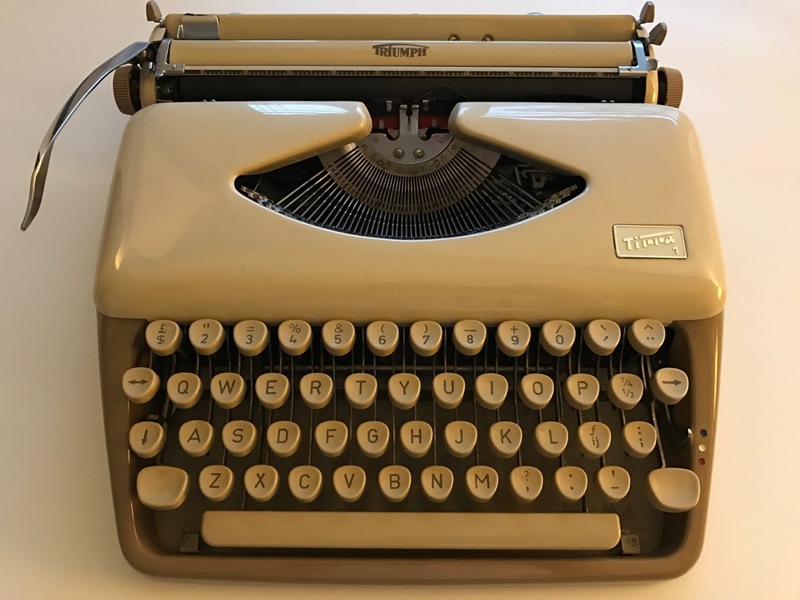 I bought a working typewriter last fall, a brown-and-beige Triumph Tippa 1. Every few weeks, I type a letter to one friend or another, and entrust the envelope to the care of the U.S. Postal Service. Whether the letter arrives, and is read, I don’t always know. The waiting reminds me of my time as a Peace Corps Volunteer in Vanuatu, where most nights I sat at the table in our house and wrote letters to family and friends back home. My friend, David Jarmul, was also a Peace Corps Volunteer. He served in Nepal before the internet allowed instantaneous, across-the-ocean communication. David and his wife, Champa, have rejoined Peace Corps and are serving in Moldova. I’m proud of David for blogging about his experience, at Not Exactly Retired. He also wrote a magazine essay about the benefits of internet connectedness, but also how that’s challenged volunteers’ face-to-face conversations with their hosts. In Vanuatu, a plate of food brought to the house was never to be returned as an empty plate. My family and friends replied to all my aerograms, and their letters fill a half dozen binders in a plastic bin in the garage. My more recent typed letters have gotten a couple of replies: one friend sent a hand-written note from her Alaskan redoubt; another friend sent her holiday note as a typed report of her change in life direction. I’m heading north at the moment, high above the sea in an airplane returning me to North Carolina. I’ve been attending the annual professional development conference of the AAMC Group on Institutional Advancement. We met in Fajardo, Puerto Rico. Normally, this time of year, I’d be with my family not too far away on St. Croix. But our impending house sale and purchase blocked another spring break on Sprat Hall beach. That meant we missed last night’s fireworks celebrating the 100th anniversary of Transfer Day, marking when Denmark gave over the islands to the States (for a price). Last Saturday, we were celebrating my mother’s birthday, with a nice meal at our table in Carrboro. Anna still had the sniffles, Oliver was a second day into fevers, and then Erin rapidly began to feel ill. I roasted chicken parts, and put them into a pot of water in the oven for the night (per Michael Ruhlman’s chicken stock instructions). The next morning, I woke early, ignored my own achiness, and went to play soccer in Durham. I returned home, added carrots and onions and garlic and tomato paste and parsley and thyme and peppercorns and bay leaf to the pot, and let it simmer for an hour. I read the perfect NYTimes magazine essay, by chef Gabrielle Hamilton, about radishes with sweet butter and coarse salt, and then the travel story about Puerto Rico and wondered if I’d have enough time during my conference to catch a ferry over to Culebra Island. I love to make chicken soup when one my family is under the weather. But this pot of soup had no effect on our ills — Monday morning, all five of us were down and out. It was clear we had influenza. I was just finishing the Danielle Ofri book, What Patients Say, What Doctors Hear. It’s quite good, and I’d underlined and annotated quite a few pages, excited to have material to add to my Voices of Medicine listening booth proposal. And yet, I was a perfect example of what Ofri explores: I’d been timid at the pediatrician’s office last week, and had failed to get the doctor to hear that my children had been exposed to flu. We were the final appointment of the Saturday, and I didn’t think the lab tech was even in that day, but maybe if I’d said more, Oliver at least would have been given tamiflu. When my flight arrived in San Juan, and I’d turned on my phone, a text came through: Oliver had pneumonia. Did not make it to Culebra. Laid low at the conference resort, kept my distance from the other attendees, religiously washed my hands. Oliver responded well to antibiotics. Erin shouldered her way through the week. I’ve been playing soccer Sunday mornings with men my age, men from a dozen countries. I hustle, fall down, pass the ball too fast or too hard, and rush toward the goal too soon. But I have fun. I’m 47 tomorrow. I remember my father playing soccer in Idaho with men in their forties. The Over the Hill Gang, I think they were called. I recently came across a photo of dad on the field in Caldwell, but that photo is buried in a bin in the garage, awaiting the move. Erin tried to get tickets to the U2 tour this summer. The band is coming through the States to celebrate the 30th anniversary of the release of The Joshua Tree album. In 1987, I listened to that album on my Aiwa personal cassette recorder while sitting in my clunker of a car, waiting for my fellow high school soccer buddies to gather for summer evening scrimmages. A glance down: brown shoes buffed bright by an airport shoe shine. My laptop now sports a tamtam transfer sticker, ordered through StickerMule. The tamtam is an upright drum in Vanuatu. My sticker is a design created for me by a friend a few years ago. The arrival of the stickers coincided with our download of the Disney movie Moana, which has an extra feature about the Polynesian music and culture that the movie so wonderfully captures. That led me to the music of the Samoan-in-New-Zealand singer Opetaia Foa’i and his band Te Vaka. And I recently came across a research article about Lapita skulls found in an ancient cemetery in Vanuatu. I was unfamiliar with the Lapita people and the recent scholarship explaining how the Lapita migrated from east Asia, into western Oceania, and became the Polynesian people. Fascinating.